Start with two pieces of cord 150" long each and fold them in half - this is where the loop will be. Still working there in the middle, use one cord to make a series of larks head knots around the other cord. Check it periodically by holding the four cords together and attempting to slip your button or bead (whatever you are using for your closure) through the loop. You don't want to get clear to the other end only to find your loop is too small, trust me. When you get the right length, pull all four cord together. Hopefully your knots stayed fairly well centered on your cords and the four lengths left hanging are somewhere near the same. Use the same cord you did the larks head knots with to make a series of square knots around the other two cords. Did I lose you? It's not hard, really. And if the larks head loop thing has you worried, just make a loop the right size and tie an overhand knot and move on. Your closure won't be as fancy, but it will work just fine. I had to be different, so I added beads to the knotting cord between each knot, but that's entirely up to you. Now pat yourself on the back, because if you got this far, it's easy sailing from here on out. 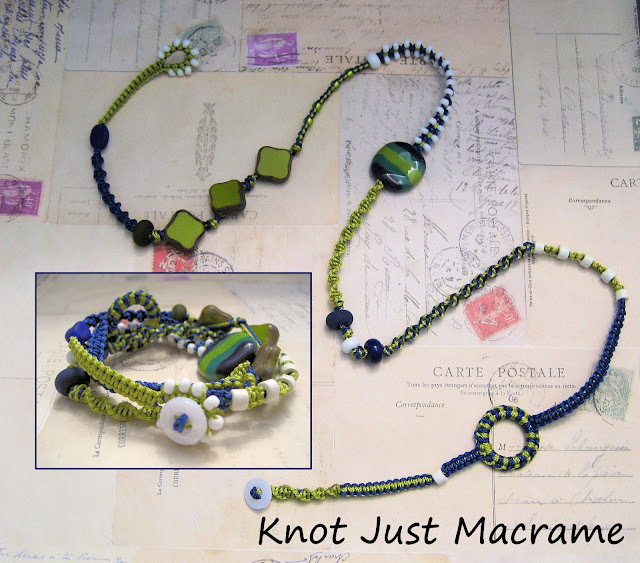 If you're still worried about the knots, I did a little pictorial tutorial here - click on the photos to see the written instructions. Channel your inner girl/boy scout. Now all you're going to do the rest of the way down is knot those four cords. In the example above, when I knotted with the green cord, the navy was hidden inside. Then I switched to knotting with the navy cords around the green ones, and an easy way to switch is to put all four cords through a bead. Then you can start knotting with the other color without the transition showing. 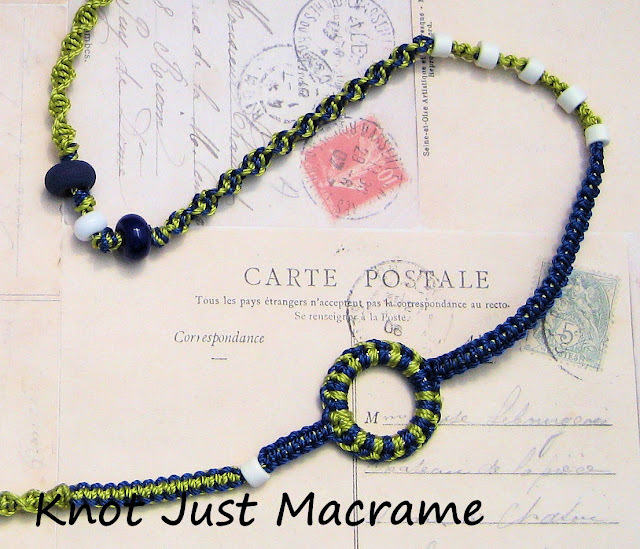 You will want to switch your knotting cords from time to time or you will run out of one color and end up with a short bracelet! Another way to transition is with an overhand knot, and I like that between beads. In the example above, the green diamonds are Czech glass and the hole was only large enough for one cord, so I put the one cord through and the other three behind the bead and tied a knot. No problem. There is no "wrong", remember? To get the two-look in the knotted section after the diamonds, I used one green and one blue cord for knotting square knots. It's kind of fun and different. Then after the white bead (hiding my transition), I did square knots with blue cord around the green. I slipped an 8/0 white seed bead on the outer (knotting) cord on each side between the square knots. The funky striped bead you see next is a Kazuri bead. The hole was large enough to get all four cord through and again, it hides my transition to knotting a half knot spiral with the green cord. Still with me? Ready for more? If it seems like your bracelet is getting really long, that's good. Mine was about 30" finished, which allows me to wrap it around my wrist four times. My wrist is only 6" so you would think this would be too long, but it isn't. You have to allow some for the bulkiness of the beads and for the bracelet wrapping over itself on your wrist. As you're going along, try wrapping it on your wrist to check the length now and then. So, back to the instructions. Green spiral, then some lampwork beads with overhand knots in between followed by another spiral, this time using one green and one blue cord (when you're choosing the cords to knot with, choose the longest ones - a couple will be shorter if you did the two color knotting up above). Overhand knot at the end of that section, then beads with a couple square knots between. Bead to hide transition and back to knotting with the other color. OK, now we're to the circle. I took one green cord and one blue cord down each side of the circle and made larks head knots alternating colors. So I did a blue larks head and then pulled the green cord from behind and tied a larks head with it. When I got enough to cover the ring, I pulled all four cords together and started square knotting again. You can totally skip this part if you don't have a ring the right size or if you're still not sold on larks head knots. Totally up to you. When you get a couple of inches from the length you want, it's time to add the button. In this case I used a plain old four hole button. I took both green cords up through one hole and down through another and did the same thing with the blue. Now pull the button down the cord or pull the cords tighter - whatever it takes to get the button in the right place for the length you want. Now you should have your long knotted strand and then the four bare cords showing AND the four cord ends hanging around in the same place, then the button on the very end. Take two of the longest cord ends you have left and use those to make another square knot length - this time starting up by the button and covering all those loose cords. Make sense? This part will be a little fatter, since you have more "filler" cords, but this whole look is about imperfect, so don't sweat it. Once you've knotted an inch or so, you can cut off the loose ends of your filler cords (it won't hurt to add a dab of glue in there if you're paranoid like me) and finish knotting until you meet the knotting where you left off, covering up all the bare cord. Tighten the last knots up well and hit them with a little glue. Trim off excess. Two 150" cords, fold in half and make a loop (any kind you like). Knot your bracelet, alternating colors and knots with random beads or whatever strikes your fancy. You can make long sections of the same knot or you can make short ones or you can mix them up. Beads are handy for hiding places where you switch knotting cords. When you get the length you like, add your button or bead and fine tune length. Continue knotting under the bead or button back toward the bracelet to cover the cords. Glue. Cut. Wrap it around your wrist, throw your first in the air in victory and go show everyone you know what you made. Great tute, Sherri. If someone like me can follow it (I can tie a knot and that's about it), anyone can! I was wondering how the cording you use compares to cotton or linen for size? This cord is .9mm - I'm not sure how big cotton or linen are? I think there's quite a bit of flexibility on the cord size, though, as long as you can find beads that will fit. Thanks for the tutorial...I have one color and need to purchase another and I want to give this a try. I have one question though about the beginning - if I am using one cord to make the larkshead knots around the other, won't those 2 ends be significantly shorter? You mention they should be near the same. Or is it that you don't need that many? Thanks for helping an OBVIOUS beginner! Nice to see you featured on Totally Tutorials today, Sherri! just had to tell you how Beautiful this bracelet is!! Now I am one of your newest followers! If you would like to stop by my blog to say hello and follow me back, that would be wonderful. Thanks for the great tutorial, Sherri! I love these long, changing wrap bracelets -- they look so cool and rich. And I've been very seriously considering the tutorials in your shop! I've picked out the one I want to start with :) Now, to jump in! 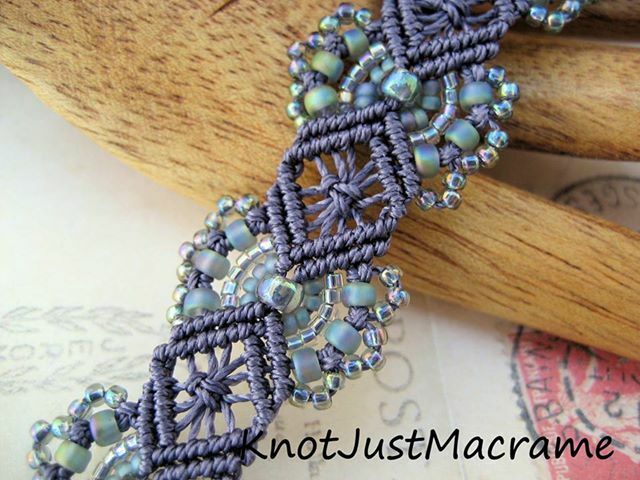 Macrame is a technique I'd love to be able to incorporate into design. Love that your Etsy tutorials are so gorgeous! Thanks, Rita! I'm working on some eClasses, too! The circle part is probably the trickiest. If you don't get it or don't have a hoop, you can always just skip that part. Or put in a really cool bead there! You do them the same way as around a cord, but around the ring instead. What size is the Dragon button. I found a site that has similar buttons. I love your tutorials.